Raptor | 13 The Creative Constructions of Richard Powell » Blog Archive » Happy Birthday, Lannia! What did I tell ya? Birthday central, I say! Today is the birthday of a close local friend of mine, Maria Clark, a.k.a. 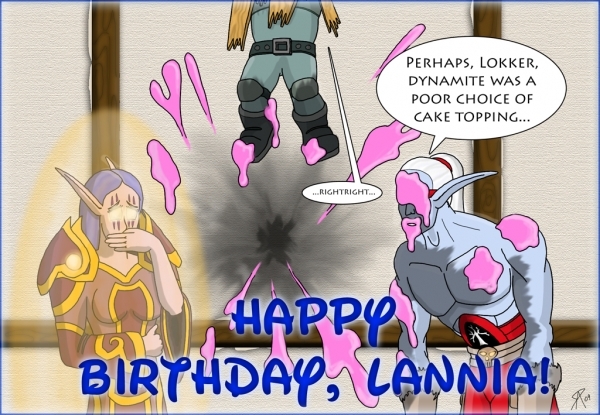 Lannia Winterstorm in World of Warcraft and @Arcania on Twitter. I hope today goes well for you. May you have a happy birthday today and many more to come. Uhm… although you may wish to keep that priest bubble handy around Lokker. He can, indeed, be … dangerous. This entry was posted on Sunday, July 12th, 2009 at 11:38 am	and is filed under Artwork and Design. You can follow any responses to this entry through the RSS 2.0 feed. You can leave a response, or trackback from your own site.